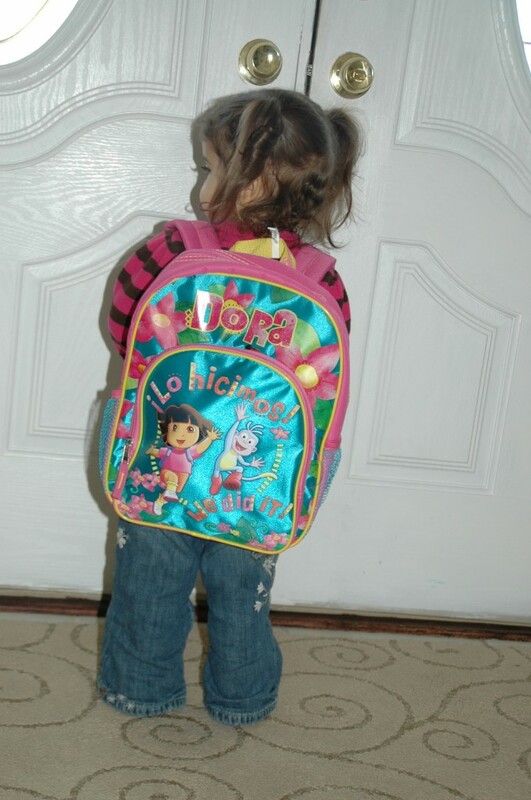 Sierra started preschool on January 31st. At just a few months past her second birthday, I don’t feel that she really needs to go to school yet, but since her baby brother is going to be born any day now and I won’t be able to keep taking her to Mommy & Me classes, she’s going two mornings a week, just so that she can have some regular social interaction with children her age. I was worried about how Sierra would do at school. She is very attached to me and, before school, had never been left with anyone other than a relative. For many weeks leading up to school, we talked about how she doesn’t have to cry because Mommy always comes back, and that some of her friends might cry, but that was okay. As we got closer to her start date, I began to feel more confident that she would be okay, but I was still worried about leaving her. Then the big day came, and when I walked her into that room of screaming 2-year-olds, the look on her face was priceless. She looked confused, almost bewildered, as if to say, “What in the world is everyone carrying on about?! ?” My (little) big girl has not shed one tear in her classroom since school began, loves her teachers, and gets so excited about working on projects and going to the gym at school. I’m so proud of her! Yesterday was the first day of Anya’s second year at pre-school, although I guess technically last year didn’t count as a year since she didn’t start until December. She’s going three days a week, currently from 9:30 am until 12 pm. We’ve been prepping her for the last week so that she’ll know her teachers’ names, which friends of hers will be in her class, etc., and reminding her that even though I leave her there, Mommy always comes back. Her first day went very well – no tears, and it only took a few minutes before she was comfortable enough for me and Lex to leave. When I picked her up, her teachers told me that she surprised them with how well she speaks, because for the first half of the morning she barely said anything and they thought she wasn’t really a talker yet. Then out of the blue she told them, “My mommy was telling me all about you!” and from that point on she was very chatty. I said she’s often shy and quiet in a big group or unfamiliar situation, and they said they highly doubt that’s going to be an issue this year. Yay!!! 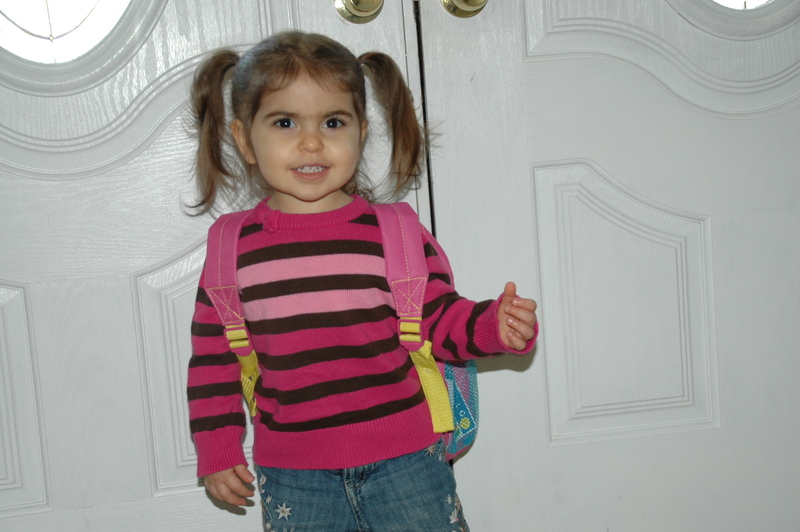 Anya’s first (half) year of preschool came to a close last week. Her class had their end of the year show for the parents on June 11th. It was very cute – the kids sang several songs, most of which we’ve been hearing for weeks from Anya. Just like at her Hannukah party and Passover seder, Anya started out a little overwhelmed by the crowd, but after a hug and some encouraging words from Mommy, she joined in with the rest of her class and did a great job. I was so proud of her! Anya’s preschool class had a Passover “Seder” last Thursday for the parents to attend. They told the story of Passover and sang some songs, and then they ate some of the holiday foods. Anya really enjoys the song about the frogs. I did film the entire show, though she spent most of it with her fingers in her mouth. I always expect but am still bowled over by how different Anya is in a big group like that. She gets so overwhelmed by the amount of people in the room that she completely clams up. A stranger observing her would think she doesn’t talk. Her teacher has commented several times to me about how quiet Anya is – yes, the very same Anya who acts out entire Dora books or episodes with her dolls and then makes up her own stories, the one who NEVER GIVES US A MOMENT’S PEACE at home! What a silly little girl. I guess she was serious when she assured me that she is shy. What present did Anya get from the grab bag? A DORA book!!! And not just any book – it’s the one WE brought in! We picked a two and half hours, two days a week program for her at one of the local synagogues. I liked it in particular because it isn’t one of those pre-schools that tries to promote its “academic focus” as a selling point for why you should send your child there. Come on, folks, these are two year olds! They don’t really need to go to school at all at this age. Her class is mainly about socialization and play time. They learn about the Jewish holidays and your basic pre-school topics (colors, shapes, community, etc.) but they don’t push reading or “school readiness” skills on them, which I love. They incorporate a lot of music and art into their schedule. I want Anya to love learning and not feel burnt out before she even gets to kindergarten. The main reason we’re sending her to school at all at her age is because with the baby coming (assuming she ever decides to arrive), we wanted to make sure she had some structured, baby-free time for herself each week. It also give me a few hours a week to get some things done with just one kid instead of two.